Historians have produced scores of studies on white men, extraordinary white women, and even the often anonymous mass of enslaved Black people in the United States. But in this innovative work, Adele Logan Alexander chronicles there heretofore undocumented dilemmas of one of nineteenth-century America’s most marginalized groups—free women of color in the rural South. 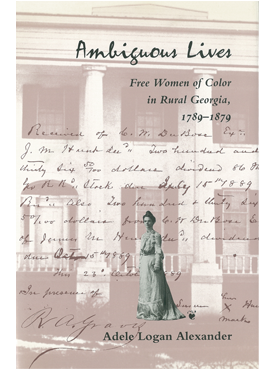 Ambiguous Lives focuses on the women of Alexander’s own family as representative of this subcaste of the African-American community. Their forbears, in fact, included Africans, Native Americans, and whites. Neither black nor white, affluent nor impoverished, enslaved nor truly free, these women of color lived and died in a shadowy realm situated somewhere between the legal, social, and economic extremes of empowered whites and subjugated blacks. Yet, as Alexander persuasively argues, these lives are worthy of attention precisely because of these ambiguities—because the intricacies, gradations, and subtleties of their anomalous experience became part of the tangled skein of American history and exemplify our country’s endless diversity, complexity, and self-contradictions. Written as a “reclamation” of a long-ignored substratum of our society, Ambiguous Lives is more than the story of one family—it is a well-researched and fascinating profile of America, its race and gender relations, and its complex cultural weave.